The Livestrong LS 13E elliptical trainer is the top of line model from Livestrong Fitness. The LS 13E is build around a heavy 30 lb flywheel which ensures a smooth experience. The stride length of 20 inches is sufficient for all users and the pedals are very close together designed to mimic the natural foot movement to reduce stress and they are cushioned for additional comfort. 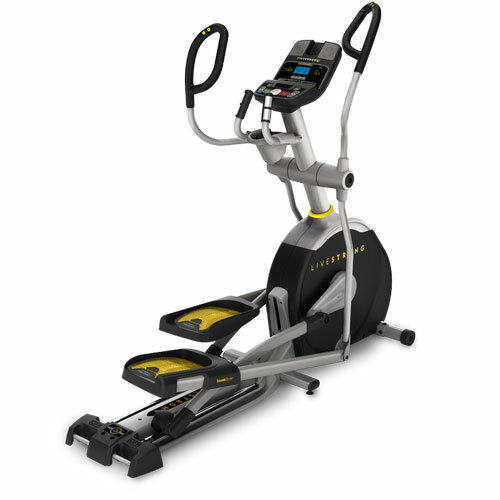 For additional cardio results, the Livestrong LS 13E elliptical trainer inclines up to 10 pct in 21 increments. Maximum user weight is 350 lbs. The blue backlit display all the information you need and controls 12 training programs and 20 levels of resistance. A very cool feature of the Livestrong LS 13E elliptical trainer is transferring your workout to Livestrong.com by using the included USB memory device so you can track your progress over time. Heart rate tracking is on the front mounted contact grips. The Livestrong LS 13E elliptical trainer has the extras you would expect, Ipod/MP3 docking station playing through quality speakers, and a cooling fan. Warranty on the Livestrong LS 13E elliptical trainer is solid for the price, lifetime on the frame, 5 years on parts and 2 years on in-home labor. In addition, Livestrong includes Free Delivery to inside your home (not just curbside) and you get 30 days to change your mind. The Livestrong LS 13E elliptical trainer is a great unit selling at a very attractive price. Definitely a must consider and highly recommended.